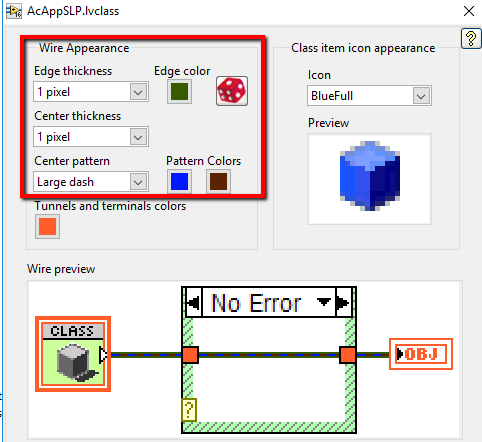 You know how you can change the wire appearance for a class in the class properties? As it turns out, LabVIEW internally allows for more flexibility than that dialog gives you. So I made an advanced wire editing tool...and unlike a lot of stuff I post, you can actually use this for serious projects, because it does not use any private/unsupported LabVIEW functionality! 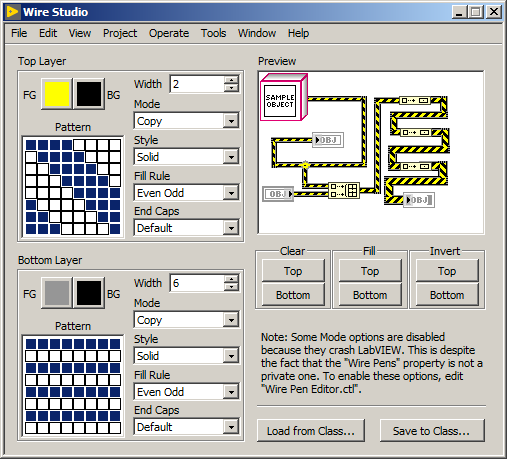 With this tool, you can set wire size without limits (with results similar to this), customize both wire layers with any 8x8 monochrome pattern, and also mess with different draw options. Strangely, a few of these settings seem to have no effect, and many of the options for one of them actually crash LabVIEW. (These ones are disabled in my tool, but you can re-enable them by editing a typedef.) Given that this is actually a documented, supported property that's officially supposed to work, I've reported this as a bug to NI; if any NI engineers see this and feel like investigating, you can refer to service request #7762024. I could try and see how well that works. Also, NI got back to me; they said they were able to confirm the issue I mentioned and they've filed an internal bug report. It should say "with locked diagrams you can't fix the problem without potentially breaking licensing, violating IP, or violating ethics". Yes that site, along with the method of signing VIs is semi-known. So..... What licence is it? I never thought to add a license to it; as you probably guessed it's not really something that readily crosses my mind. 😛 I don't really care what you do with it; I guess I'll put it under the MIT license or something in the next revision. You're welcome to use whatever license you want, but for LabVIEW we see lots of people use BSD for the kind of "I don't really care, just have this and I'm not responsible, and leave any attributes I have in the source" kind of thing. Obviously that is oversimplifying it. Here is a thread on LAVA. Why not merge it into OpenGDS's wire editor and create a Pull request. I never thought to add a license to it; as you probably guessed it's not really something that readily crosses my mind﻿. 😛 I don't really care what you do with it; I guess I'll put it under the MIT license or something in the next revision. This may be a misunderstanding from my end but I thought if you did not include any license then your code defaults to "not really open source". I'm not a lawyer but choosealicense.com/no-permission/ is where I was reading that and I have used the site before to get the TL;DR for licensing. MIT is a good permissive licence. Unless you categorically state otherwise, LavaG.org cannot technically even distribute it to us which, I expect, would not be the intent. It's a minefield and just choosing one, regardless of what it is, saves so many headaches for your intended users and for LavaG.org. Copyright is gained automatically when a work is created. At least in the US, works first published after March 1, 1989 need not include a copyright notice to gain protection under the law. It legally prevents anyone from copying it, unless it is accompagnied by a license that specifically allows that. The technical term is "All Rights Reserved" and grants no rights to anyone apart from the original author. The important part here is "Rights" which has nothing to do with software, per se. The definition of "Open Source" is a bit nebulous depending on who you ask (OSI is different from FSF, the latter of which is more of an ethos). I err on the side of caution and choose to interpret it to mean "source distribution" and completely separate that term from licencing-I know where I stand then. Its definitely open source, you just can't use it or copy it...and I imagine flarn could sue you if you release something kind of like his code and its discovered that you knew about this code. User Contributions. Any information or material ("Communications") that you transmit to this Site is considered non-confidential. NI has no obligations with respect to the Communications, and NI is free and you authorize NI to copy, disclose, distribute, incorporate, translate and otherwise use the Communications and all related data, images, sound, and text for any and all purposes. NI reserves the right, in its sole discretion on a case by case basis, to remove, reject, or otherwise modify any such Communications or any portion(s) thereof. That's pretty much how it all works. Of course that doesn''t mean that you can't bend the system if you have particularly deep pockets to buy the necessary lawyers to get a court ruling that may sound and feel like the opposite of this. Generally however the money involved is not high enough for such things. The only real problem if flarn would want to sue someone using that VI is of course to find out about the illegal use first and then to proof that that other person didn't invent it themselves independently of his posting. But that is an entirely different story. Having right doesn't always mean to get that right. And yet all they're using is plain black lines connecting the nodes. In this thread? Really? Bumping this thread because I've posted a new version; see the OP.